At left is a beautiful deep black finished bowl by Stella Naranjo Chavarria (b 1939). 4.35 by 3.25 inches. $210. Next is a piece by her daughter-in-law, Vickie Martinez Tafoya. 3.75 by 3.25 inches. $105. Then come two views of a less common shape for work by Vickie - a low shoulder piece - which can be tricky to do. 5.25 by 3.25 inches. $180. A wonderful turtle-inspired pottery vessel, by Ryan Roller. 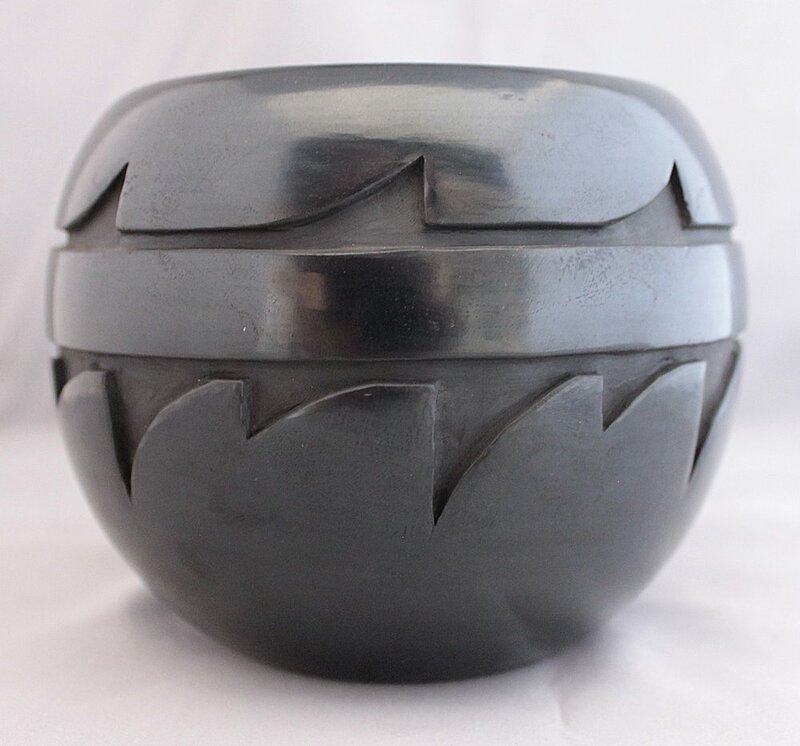 5 inches across and 3 inches high.SOLD Ryan also made this striking ‘barb-wire’ design blackware jar, 4 by 5.25 inches. $600. A beautifully executed bowl by Orville and Effie Garcia. 2.25 by 3.75 inches. $220. Both redware are by Vickie Martinez Tafoya. The one at left with an Avanyu (water serpent) and feather motifs is 7 by 5.75 inches and $300. The other, also with an Avanyu design (the face is around the other side) is 4.25 by 5.2 inches. 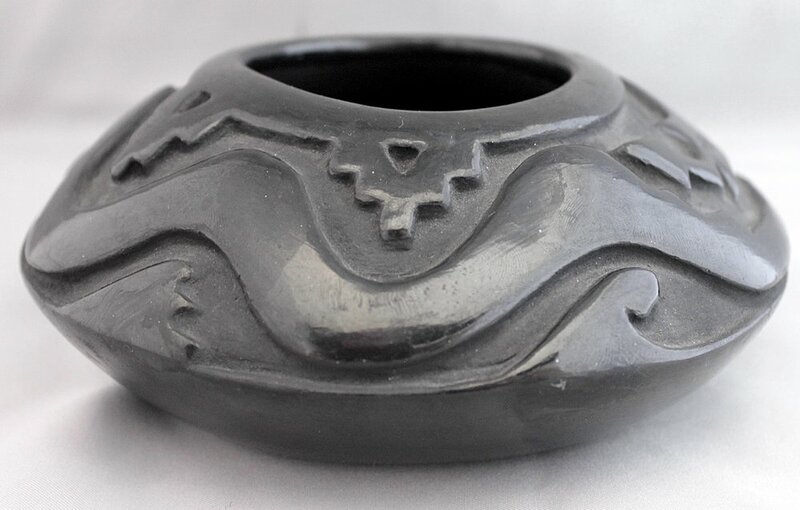 Martha Appleleaf of Santa Clara Pueblo brought in one of her signature matte green on polished black ware jars. 6.75 inches high and 6.25 inches across. $600. A carved redware by Vickie Martinez Tafoya of Santa Clara. 12 inches high. $1500. Vickie was taught to pot by her grandmother Flora Naranjo and mother Barbara Martinez, but it was her mother-in-law, Stella Chavarria and her mother, Teresita Naranjo who helped her further develop and refine her work, encouraging her to take it to the next level. As a result, Stella’s and Teresita’s quality and style is evident in her work. 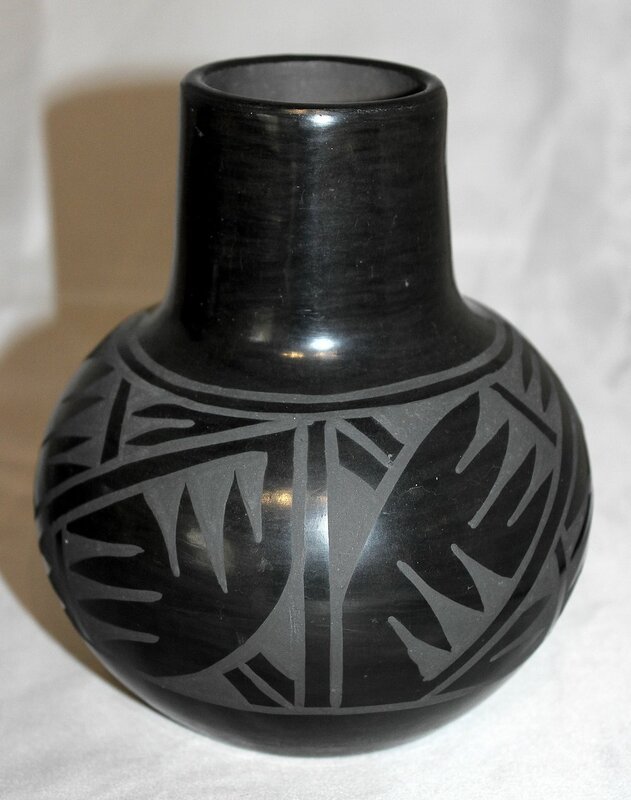 A blackware vase by Minnie Vigil (Santa Clara-Poajoaque) who is best known for her polychrome ware. This was made about 20-25 years ago as Minnie, now 86, makes very little pottery anymore. 6.5 inches high. $400. Vickie Martinez Tafoya made both the black and redware jars, each with a a carved stylized Avanyu or water serpent motif Each is 3.75 by 5.5 inches and $195. At right are two views of another Avanyu bowl, this one by Millie Chavarria (b 1946). It measures 2 by 6 inches and is $165.